I live on the river in Annandale and since moving here 18 months ago have developed a great love of birds – they are in my garden and on the river. I manage to identify most of them but there is one little fellow I just can’t – I have googled, looked in the books and sites. It is not a very pretty little bloke but I love them. They are, I would imagine, a finch, [with] the round little fat body, always in a flock of around 10 -15, fly very fast, love the seed in my lawn, love my bird bath as it’s very protected. He is a medium flat brown with a black mask across his eyes, has a short tail, easily frightened. This little bird is too small for me to get a photo with my camera. Malcolm do you have any idea what it is, I would be grateful for your comments. I was happy to help, especially as Lynne had provided such a good description that there was only one real candidate, the Spice Finches (Lonchura punctulata). As I told her, they are Asian birds, relatively recent arrivals in our region but now well established in our parklands, so older bird books might not describe them, or might not show them as living here. 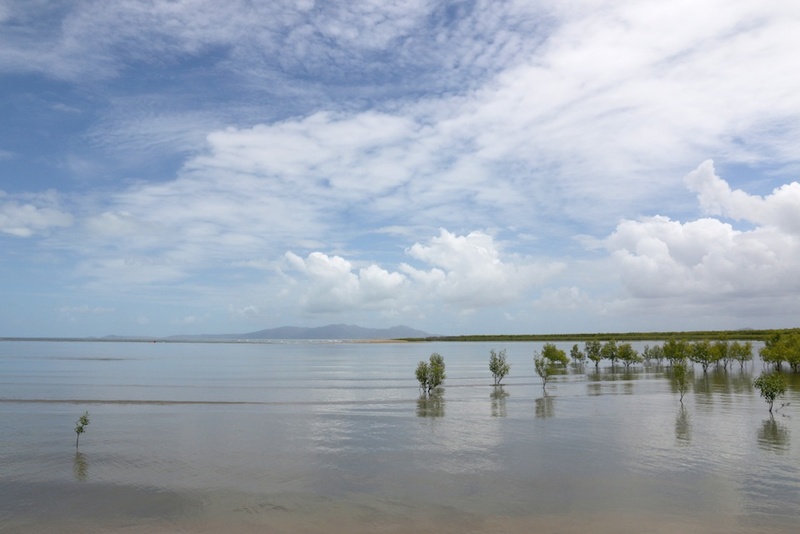 Business in South Townsville ten days ago was enough excuse for a brief visit to the mouth of Ross River. I parked near the end of Boundary Street and walked along the beach to towards the new bridge for this dramatic cloudscape. (We’ve seen lots of promising clouds lately, but still very little rain.) 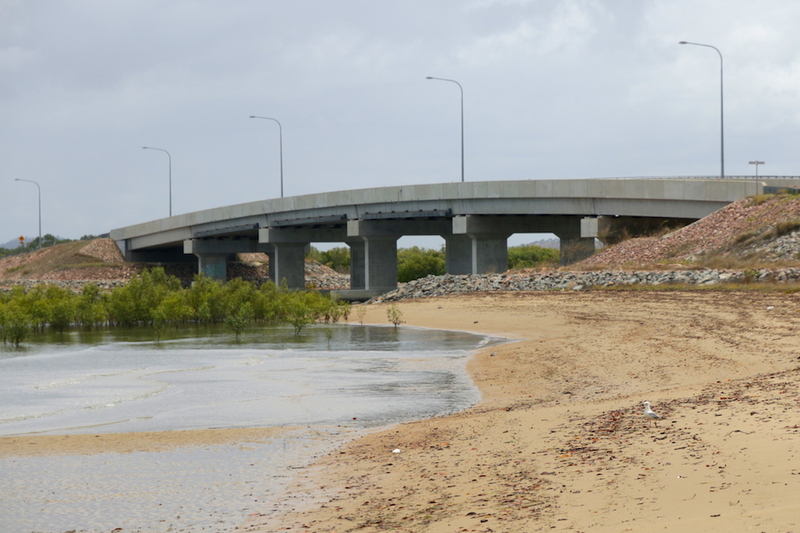 Construction of that bridge and its associated Port Access Road, by the way, is what was blamed for driving the flying foxes and ibis away from the mangroves in the distance to the Palmetum and Dan Gleason Gardens. A friend sent me this photo and the subject has enough points of interest that I asked her permission to publish it here. The (really obvious) questions are mine, of course – the Q&A format is just for fun. What is that spiky ball? It’s a flower – more accurately, a flower cluster – of the Leichhardt Tree, Nauclea orientalis. So the butterfly is sipping nectar from it? Yes. Butterflies are not fussy eaters. They think nectar is nectar, and so long as they can reach it with their proboscises they will take advantage of it. I’ve seen the butterfly before but not that weird flower. I guess the tree is an exotic? Wrong way round, actually: the tree is a native but the butterfly is a foreigner. It is well naturalised by now but is an American species, the Monarch or Wanderer, Danaus plexippus. Back home, they are famous for their mass migrations. Here, they have spread from Sydney (1871) to Southern West Australia and (obviously) North Queensland. Is there any connection between the butterfly and the flower, then? Yes, but it’s indirect. The Monarch is a Milkweed butterfly (Danainae, a sub-family of Nymphalidae) and their caterpillars do require particular plants. Let me guess: milkweeds? Yes – well done! And the botanical family is noted for milky white sap, often poisonous. The caterpillars tolerate and absorb toxins from the food plant, making them distasteful to predators. Local plants in the family include oleanders, frangipani and lots of the smaller weedy plants which grow along river banks. And the tree? It’s not a milkweed, but it likes wet feet so it grows along river banks too. This one was beside Ross River near the Bush Garden. 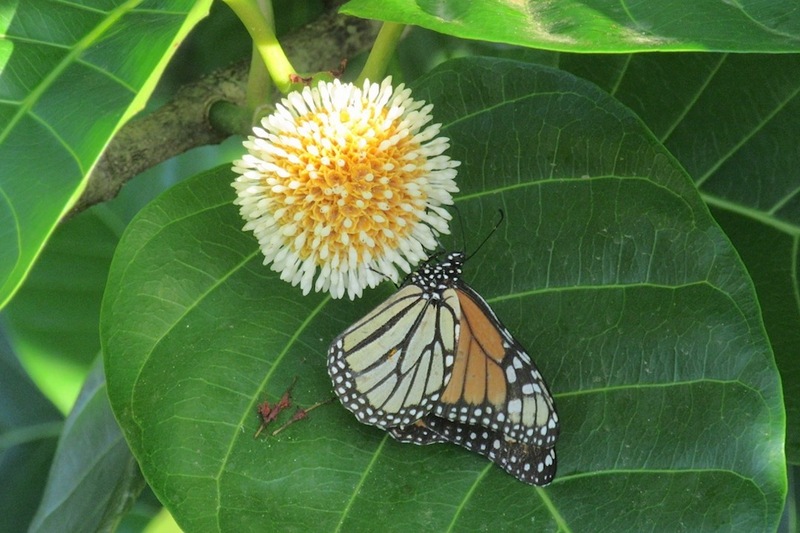 And that completes the reasoning: the adult butterfly was near the river to lay eggs on the milkweeds; the tree was near the river for the water; and its flower was a convenient snack for the butterfly.